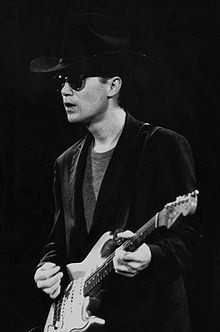 Marshall Howard Crenshaw (born November 11, 1953) is an American musician, singer, songwriter, and guitarist best known for hit songs such as "Someday, Someway," a US Top 40 hit in 1982, and "Whenever You're on My Mind." His music has roots in classic soul music and Buddy Holly—the latter to whom Crenshaw was often compared in the early days of his career, and whom he portrayed in the 1987 film La Bamba. A quote from Trouser Press summed up Marshall Crenshaw's early career: "Although he was seen as a latter-day Buddy Holly at the outset, he soon proved too talented and original to be anyone but himself." Born in Detroit, Michigan, he grew up in the northern suburb of Berkley. He graduated from Berkley High School in June 1971. He began playing guitar at age ten. During and after High School he led the band Astigfa (an acronym for "a splendid time is guaranteed for all", a lyric from The Beatles' "Being For The Benefit of Mr. Kite"). He got his first break in 1978, playing John Lennon in the musical Beatlemania, first as an understudy in New York, then in the West Coast company, then in a national touring company. He left the show in February, 1980. After launching a trio in New York (with his brother Robert on drums, and Chris Donato on bass), he recorded "Something's Gonna Happen", for Alan Betrock's Shake Records, after which he was signed to Warner Bros. Records. Robert Gordon took Crenshaw's "Someday, Someway" to #76 in 1981, and Crenshaw's own version made #36 the next year; it would be his only solo Billboard Top 40 'Pop' hit. On the Cash Box magazine chart the song fared slightly better, reaching #31. Its biggest reception was at AOR (Album Oriented Rock) radio, reaching #25 on Billboard's Rock Tracks chart. Crenshaw's eponymous first album included the U.S. hit, "Someday, Someway". His second album, Field Day, was released in June 1983, sported a somewhat heavier sound, as evidenced on "Whenever You're on My Mind," that reportedly displeased a few listeners, but which is regarded by many critics as Crenshaw's best, and one of the classic power pop statements, although Crenshaw's work, somewhat like the late Alex Chilton's, transcends the genre. "Some of the stuff I've done you could call power pop," he told an interviewer, "but the term does have sort of a dodgy connotation." Although the song did not reach the Top 40 on Billboard's Pop Charts, "Whenever You're On My Mind" reached # 23 on Billboard's Rock Tracks chart. In 1986 Crenshaw and his band made a feature appearance in Francis Ford Coppola's film, Peggy Sue Got Married. Later that same year Crenshaw portrayed Buddy Holly in La Bamba, and was featured on the soundtrack album. The album reached #1 in Billboard and was certified double-platinum. In 1989, he compiled a collection of Capitol Records country performers of the 1950s and '60s called Hillbilly Music...Thank God, Vol. 1, which was extremely well received. In 1993, he made an appearance in the cult TV show The Adventures of Pete and Pete, in the role of a guitar-playing meter reader, and in 1994, he published a book, Hollywood Rock: A Guide to Rock 'n' Roll in the Movies. He continued to record in the 1990s and 2000s. "Better Back Off", a song from the album Life's Too Short, reached # 17 on Billboard's Alternative Songs Chart. In 1999, Crenshaw released the critically acclaimed #447. In the 2000s, he played guitar as a special guest with the reunited members of the MC5. Crenshaw continued to perform at about 40-50 concerts a year, most of them within driving distance of his family home. Crenshaw himself has dubbed these shows part of "the NPR singer-songwriter circuit." In 1996, Crenshaw co-wrote "Til I Hear It From You", with Jesse Valenzuela, and Robin Wilson of the Gin Blossoms, for the soundtrack of cult-film Empire Records. "Til I Hear It from You" began receiving radio airplay in August 1995, appearing that year on the Adult Contemporary chart in Billboard magazine - with a December peak of #5 - and also appearing on both the magazine's Album Rock Tracks and Modern Rock Tracks in with respective chart peaks of #4 and #5 in September. The track did not appear on the Billboard Hot 100 in 1995 or early 1996 due to the track not originally being available in a format then eligible for Hot 100 ranking. In Canada "Til I Hear It from You" reached #1 on the singles chart dated September 25, 1995, based on airplay: the track became Canada's longest-running #1 hit of 1995, its #1 tenure being six weeks. Crenshaw penned the title track from the 2007 film Walk Hard starring John C. Reilly; the song, as sung by Reilly, was nominated for a Golden Globe Award for Best Original Song, and a Grammy. Jaggedland, was released in June 2009 on his 429 Records. In 2011, Crenshaw began hosting a radio show called The Bottomless Pit on WFUV in New York, featuring his vast collection of recorded music. In 2014, Marshall Crenshaw was voted into the Michigan Rock and Roll Legends Hall of Fame. On October 23, 2015 Crenshaw played at the Adler Theater in Davenport, Iowa, at a campaign event for Bernie Sanders, Democratic candidate for president, which also featured Wayne Kramer and numerous other performers. Owen Paul's version of this song was an International hit in 1986, peaking at No. 3 in the UK singles charts, Top 10 throughout Scandinavia, Top 20 in (West) Germany. ^ a b "In the News: MARSHALL CRENSHAW: Jaggedland". 429 Records. Archived from the original on December 1, 2017. ^ a b c Koda, Cub. "Marshall Crenshaw | Biography & History". AllMusic. Retrieved June 17, 2010. ^ a b Christgau, Robert. "Robert Christgau: CG: Marshall Crenshaw". Retrieved June 17, 2010. ^ "Marshall Crenshaw ••• Top Songs as Writer ••• Music VF, US & UK hits charts". Music VF.com. Retrieved May 5, 2015. ^ Leopold, Todd (August 25, 2005). "Rock 'n' roll Renaissance man". CNN. ^ Baker, Cary (December 3, 2007). "Marshall Crenshaw Writes Title Track for Walk Hard, a New Movie from Kasdan and Apatow". modernguitars.com (Press release). Archived from the original on April 30, 2008. Retrieved May 5, 2015. ^ "The Cover Project, "Marshall Crenshaw"". ^ "Marshall Crenshaw Discography at Discogs: Singles-EPs - Releases". Discogs. ^ Whitburn, Joel (2008). Joel Whitburn Presents Rock Tracks 1981-2008. Menomonee Falls, Wisconsin: Record Research. p. 64. ISBN 9780898201741.